Thanks to 2015 Hazon Ride Planning Team member, Jenn Solomon, we have a detailed training plan- including weekly tips, informational videos, and much more- to prepare you for your multi-day ride. Click here to check it out: Hazon Ride Training Plan. Planning your goals, training objectives, training program, and particular rides and routes takes very little time and is extremely valuable as your ride approaches. Take some time to think about your goals for your training. Think about when you can make time to ride, where you can ride, who you might ride with, etc. Make sure the goals are achievable and monitor them weekly. It can be helpful to break larger goals into smaller, more specific objectives that have a time goal attached to them (e.g. “Ride 40 miles by June 15 without getting off the bike before 15 miles). These goals can change, but it helps to commit them to paper. Before hopping on your bike for the season, make sure it’s in good working order. To do this, take it to a bike shop and get it tuned up. Plan for another tune-up about 1 to 2 weeks before your big Ride. Make sure that in addition to having a working bike, you have the proper gear, spare tubes, and snacks that you need. Early in the season, it can be cold. It’s important to dress appropriately for riding. Because weather changes, it helps to dress in layers or wear detachable arm and leg warmers which can be removed more easily than a jacket and pants (and take less storage room). To avoid injury, it is important to let your body get warmed up as you start your ride. Do an easy lap first, or a slow jog for at least 3 minutes before a ride. Then stretch. This will enhance your circulation and prepare your body for physical exertion. Stretch before, during, and after each ride. If you keep your muscles warmed-up and flexible, you are much less likely to feel sore the next day. While riding, every 30 minutes stand on the pedals, arch your back and stretch your legs. You should pace yourself according to your end goal. If working towards riding in a large ride, you should aim to ride 75% of your longest distance at a comfortable pace at least once beforehand. If you are training towards a multi-day ride, you should also train towards cycling for consecutive days. If you are planning on riding 80 miles followed by 50 miles in the New York or California Rides, you should be able to ride for consecutive days of 60 and 30 miles. If you are doing the shorter routes of 40 and 30 miles, you should have ridden days of 30 and 20 miles beforehand. If training for the Israel Ride or Cross-USA Ride, you should work towards riding significant distances multiple times a week. Take it slowly and build up your ability over time. Ride or exercise at least two or three times a week, and gradually increase length and intensity. Try to do one long ride every week. That one long ride should be 50% of your weekly total, and should increase by about 10% each week. This rate will ensure that you build your muscle strength and cardiovascular endurance gradually. By 6 to 8 weeks before the event, you should be riding three times a week, even if it is for only 30 minutes at a time. Riding 45 minutes a few times a week is much better than two to three hours all at once. If you can’t get out on your bike, try indoor spinning classes, a great simulation of cycling. Use your bicycle to commute, if you can. Try to get a short, but intense ride in before or after work. Consistency is paramount for training. Although you’ll experience some of cycling’s benefits almost immediately (more energy, more restful sleep, etc. ), an appreciable increase in fitness will require several weeks of consistent training. To attain the long-term fitness and health benefits of a cycling exercise program you should put in at least 20 to 60 minutes of cycling, three to five times per week, for at least 8 weeks, preferably more. Here is a sample chart to guide you on your training, based on the riding groups of the Israel Ride. If you have more or less than 12 weeks, condense or expand the chart appropriately. Each week, you should attempt one long ride and a few shorter ones. Your mileage each week should increase from the week prior. Keep track of your rides, noting your speed, distance, terrain, and even how much you ate or drank if it helps you fine tune your cycling experience. This is the hardest to master, but is one of the most useful tools to learn. On terrain that has rolling hills, knowing when to shift your gears up or down can be key to maintaining your momentum and saving you a lot of energy on longer, hillier rides. The system of gears on multi-speed bicycles lets you choose different pedaling rates (cadences). Your cadence is the pedal revolutions per minute, and ideally your cadence should not fluctuate too much when you ride. Skillful cyclists use a brisk, steady cadence of 90-100 pedal revolutions per minute, using the various gears to maintain a constant cadence over varying terrain (you will eventually drop on tough hills, but generally try to maintain a constant cadence). Spinning in a gear that is too low (making it “easier” to pedal) is tiring and makes for a choppy ride; pushing a gear that is too high (making it “harder” to pedal) is a primary cause of knee problems and the major reason people must stop cycling on a tour. (This is an especially common error but remember, when you’re riding long distances, you don’t want to feel like your legs are working hard!) At first, a cadence of 90 may seem that you are moving your legs much faster than your comfort level, but if you train to adapt to that pedal speed, you will find it less tiring on a long ride. While our rides are on-road, there are still obstacles to avoid, such as glass, sewer grates, and other debris on the road. Knowing how to comfortably handle your bike to maneuver around such road hazards will increase your safety and the safety of riders around you. You should also be comfortable to move your body while on your bike. To practice, find a painted straight line in a parking lot or a cycle path and follow it as closely as you can. Practice looking back until you can do so without veering to either side. Though not required, a rearview mirror attached to your helmet or handlebars will make checking behind you easier and safer. A cardinal rule of bicycling is to brake before you must, especially on curves and down hills. Brake just before going into a curve; then, if you need to slow down more, brake gently with the rear brake while in the curve. Always apply brakes gradually so you do not skid and so that you do not surprise anyone behind you. Either squeeze both breaks at the same time or apply right (rear) first, and then ease on the left (front) break, so as not to flip over your handle bars. This may be the longest ride you have ever trained for. Even if you have ridden longer distances in the past, cycling for multiple days is a tough challenge. While you should focus your training on skills, speed, and hill climbing and descending, proper endurance training will help you enjoy the whole ride. This is especially important if training for the Israel Ride or Cross-USA Rides. In addition, you should try to do one longer ride per week, two hours of more, which you should increase in length and difficulty as the ride nears. If you are just starting to train, you do not need to be setting speed records or conquering hills on these rides, but should focus on building stamina by riding steadily for long periods of time. Hazon rides cover a wide variety of terrain, including many challenging hills. Most of the days are rolling hills – but sometimes there is more up than down. It is important to train for these hills, both in terms of endurance and cycling technique. For rolling hills, the key is to attack the hill. Most climbs are preceded by a descent, however short, or a flat stretch. You should use the descent to gain speed and use that momentum to carry you up as much of the hill as possible. The key to this is to pedal fast down the hill, and then to shift your gears as you transition to the climb so you keep up the fast pedal speed as you ascend. You will find that hills are much more manageable if your momentum has carried you up a portion of the climb. For longer climbs, remember that you can always stop to take a rest – especially if it is hot out and your heart rate is high. On the challenging climbs, we often have crew cheering at the top or along the climb with water. Along with the climbs, there are many long descents. Remember that you do not need to set any speed records while going downhill – the most important thing is to remain in control at all times. Brake early. Don’t wait until you are on the brink of going to fast, but control your speed the whole way down. Drive slowly and alertly. On country roads it’s easy to get lost in your thoughts and enjoy the scenery. In the city, be aware of your surroundings – watch out for pedestrians, children, pets, and of course, cars. Take up a lane if needed. In most places (including California and New York) a cyclist has a legal right to occupy a full lane. On Hazon rides, most of the busier roads that we will be on have two lanes, so it will be easy for cars to go around you. If there are two lanes and cars are just inching by you on your left, move over into the lane so cars switch lanes instead of almost hitting you. Make yourself seen – Turn on any lights on your bike, ideally a headlamp in front and a strong blinking light in back. Watch out for obstacles – Puddles can be deep and cover pot holes and other items that can give you flat tires. Wet leaves and other debris can be very slippery and cause you to fall, especially at high speeds or while turning. Be careful of painted white lines – they can be slick. Check online for more rainy cycling tips. Keep yourself fully hydrated. Even water that has become lukewarm will replenish the precious body fluids that pour out of a rider’s body on a hot summer day. Protect yourself from the sun, use sun block, with an SPF of at least 15, on exposed skin. A waterproof brand is more effective against dilution by perspiration. Putting it on 20 to 30 minutes before going out will make sure it penetrates the skin well. GET USED TO IT – SLOWLY! Few people have a natural knack for riding in extreme heat, but most can improve with practice. If you’re planning a century ride in July or August, be sure to get in lots of shorter warm weather rides before you tackle the big 100. In short, acclimatize yourself. Training is always important, but it is especially valuable for helping your body get accustomed to heat. Oh, and be sure to drink plenty of water. When training, it is very useful to record your distance and speed, so you can track your progress. There are various bike computers units that provide your speed and mileage. We recommend getting a computer that also measures your cadence or pedal speed. Having such tools can also improve your cycling skills. Each day of a Hazon ride we will provide a turn sheet or basic map which explains the daily route. These will have mileage markers for turns, climbs, or other landmarks along the route. Knowing your distance is key to having an enjoyable ride. You can also get a GPS unit to mount to your bike, and our routes are usually available to download. You can also use websites like www.ridewithgps.com, www.gpies.com, www.mapmyride.com to map out routes that can be downloaded to GPS units. There are now some smartphone apps that can have many of the same features. 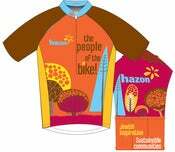 Hazon sells various cycling apparel from previous events through our online store. It is mandatory to wear a helmet when riding with us as they are the most effective way to prevent a life threatening accident. Find a helmet that fits snugly, comfortably, and allows maximum visibility. Your local bicycle store should be able to properly fit a helmet for you and sell you a good quality product. It is highly recommended to invest in biking jerseys to maximize your riding comfort. Biking jerseys come in all styles, from sleeveless to long sleeved and are made of special fabrics, like thin lycra which wick the sweat and are extremely breathable. Most come with pockets on the back for you to put lightweight items in, like snacks or your phone. You should invest in a riding jacket or lightweight rain coat in case of weather. Do not wear cotton shirts or sweatshirts which absorb moisture and become extremely uncomfortable. Choose shorts made of Lycra Spandex. The padded liner is essential to a comfortable riding experience and you wear bike shorts without underwear (to prevent chaffing). Riding shorts come in many different styles, including baggy shorts, capri length, and even skirts. Make sure to find what fits best and makes you feel the most comfortable. Do not wear jeans, sweatpants or pants made of cotton as they hold moisture and cannot breath like modern fabrics. Feet are sweaty so it’s important to have breathable socks. Choose technical fabric socks made for cycling that will wick the sweat away. It is essential to wear comfortable and supportive closed toed shoes while cycling. For advanced cyclists, try biking shoes or cleats which literally snap into a receptacle on the pedal. You will have greater riding efficiency with clipped into pedals. Another great option for beginner and intermediate cyclists is to wear sneakers or running shoes. Even if not “clipped in,” having a cycling shoe with a sturdy bottom will give you more power when you pedal. You can also install plastic “cages” on the front of your pedal which keep your feet in place. Do not wear sandals, boots, flip flops or open toed shoes while cycling. The best diet for a cyclist has been studied to no end. Even though we are riding more for fun than for performance, it is important to consider a good diet before embarking on your ride. Everyone is different, but you’ll probably find that you’ll need to consume a lot more calories during long rides. Stop and snack frequently while riding to make sure that your body gets a consistent supply of fuel. From before you get on your bike until the end of your ride, the food that you eat will affect your performance on the bike. 65-70% of your calories from carbohydrates, such as whole grain pastas, potatoes, bread, cereal, fruits, and vegetables. 15-20% from fats. No more than 10% of your fat should be saturated. Look for foods with healthy fats, such as avocado, olive and canola oil, almonds, flax seeds. 10-15% from lean proteins, such as fish, poultry without skin, tofu, tempeh, seitan, lowfat or nonfat cheese or yogurt. Vegetarian and even vegan diets are great alternatives, as long as you combine your legumes and whole grains to make complete proteins. When cycling, eat and drink constantly, even when you don’t feel hungry or thirsty. Consuming liquids and solids before, during, and after a ride prevents dehydration and exhaustion; ensures the consistency of your glucose (simple sugar) levels, which feeds your brain and muscles; and greatly increases your ability to perform that day and the next. By eating early enough before riding, you will allow enough time for the energy to move from your stomach to your muscles, where you want it. Try to drink 2 to 3 cups of cool plain water one hour before, and 1 to 2 cups about 15 minutes before starting (you should be urinating frequently, and your urine should be clear). Once you get going on the bike, you will need to continue to provide fuel for your body. Experiment with easy-to-eat items during your training rides. But remember not to try anything new on the day of the BIG ride. Find out what you enjoy most and stick with it. Try different energy bars and sports drinks prior to the ride itself. This is a personal choice. Make sure whatever bar/drink you consume is easily digested and tolerated by your body. In order to avoid a drag in energy, plan to eat about 30 – 60 g of carbohydrates for every hour you are on the bike. What does this mean? Other good snacks: energy bars, pretzels, fresh and dried fruit, nuts, and trail mix. Don’t skimp on the carbohydratesâ€”complex carbs will provide a sustained energy source and simple carbs will give you instant energy, which is essential on a long distance ride. Some simple carbs are: juice, white bread, cookies and many granola bars that have sugar as a primary ingredient. Everyone is different, but you will probably find that you will need to consume a lot more calories during long rides. Stop and snack frequently while riding to make sure that your body gets a consistent supply of fuel. On a long distance ride, you typically burn 300 calories every 10 miles, and it is very important to replace these burned calories. From before you get on your bike until the end of your ride, the food that you eat will affect your performance. Do not rely on salads, low calorie food and diet food while on a ride â€” your body has turned into a calorie burning machine, and you need to feed it! 1 cup of 1 percent milk, or nonfat/ lowfat yogurt. Make sure you are getting enough vitamins and minerals to keep your immune system strong. Eating fresh fruits, vegetables, and whole grains are the best ways to get your nutrients, but you may want to take a multi-vitamin/mineral supplement to ensure you are getting adequate amounts. Finally, get a good night’s rest so you can get up and do it all again tomorrow morning! Even if you don’t feel like you’re sweating, you’re always losing fluids while riding, and if you don’t replace them you risk dehydration, which can lead to very serious problems. If you are not urinating much while you ride, you are not taking in enough liquids. Alternate servings of water with servings of electrolyte replacement drink during strenuous exercise. You may want to have both a bottle of water and one of energy drink on your bike. Drink not for what you need immediately but what your body needs in reserve. If you wait until you are thirsty to drink, you have waited to long. Adequate hydration is essential for a healthy ride. Exercise performance suffers with as little as 2 percent loss of body weight due to dehydration. Drink at least 2 cups of water about 2 hours before you get on your bike. Whether you feel thirsty or not, drink 1/2 cup of fluids for every 10-15 minutes you are on the bike. Weigh yourself before you ride and when you get home. The difference is water loss (sorry but you can’t lose fat that quickly!). Ideally, you should have drank enough fluids during the ride so that your body weight remained relatively unchanged. If you did lose weight, consume 2 cups of water for every pound of body weight you lost during the ride. Note how much you did drink and on your next ride increase this amount by the number of cups you drink by that number. Check the color of your urine. It should be very light yellow, if your pee is dark, you haven’t been drinking enough. If your urine has no color, you are adequately hydrated. Make sure you monitor further fluid intake since there is also the risk of over-hydration â€” hyponatremia. This can cause fainting too, because you dilute your system too much of its ions and electrolytes. Try adding an electro­lyte supplement to your water and eat salty snacks. Sports drinks are for sports. Beverages such as Gatorade or Powerade have electrolytes that are lost in your sweat and carbohydrates to keep your energy level up. Experiment with different flavor drinks to find the one that you like the most, the more you enjoy it the more likely you will drink enough. Look for drinks that have sodium (Na) and potassium (K) and are relatively low in calories; however do not choose no- calorie drinks as adequate energy is essential for long rides. If riding in hot climates, such as on the Israel Ride, you need to compensate by increasing your fluid intake. Don’t let how sweaty you feel be your guide. Continue to drink ½ cup of fluid every 10 – 15 minutes (2 cups/hour). Choose a sports drink (not just water) to ensure adequate carbohydrates and electrolytes. Remember to check your urine and don’t wait until you are thirsty. Cycling, like any recreational activity, can be dangerous. But, if you follow proper cycling rules and etiquette it can be safe and enjoyable. Hazon rides attract cyclists of every age, degree of athleticism and riding styles. Our goal for each of you is to enjoy your ride in a safe and injury-free manner. Left arm straight out to the left indicates left turn. Right arm straight out to the right indicates a right turn. You can also indicate a right turn with your left arm, held at a right angle pointing up (this is a bit safer than using your right arm because you can keep your right hand on the right (rear) brakes). Left arm at a right angle with the hand pointing down indicates slowing and stopping. Point out road obstacles i.e. rocks, gravel, broken glass, drainage grates, and potholes. Always use your arms as pointers and your voice to draw attention to any impending obstacles. The following CALL OUT signals is encouraged for all cyclists. Never think that someone else is loud enough for the cyclist in front of you to hear him or her, always add your voice and send the message forward or backward – depending on the situation at hand. For example, when coming to a stop with 20 fellow cyclists, ALL 20 cyclists should be calling out, Stopping! This keeps everyone alert. “Car back” used when you hear a car approaching from your rear. When you hear a fellow cyclist saying “Car back” you must also say it so the cyclist in front of you can hear it, and on up the line. “Car up” used when riding on a narrow roadway and you have a car approaching you. “On Your Left” used EVERY TIME you pass another cyclist. Never pass a cyclist on the right. “Tracks” used when approaching railroad tracks. Always cross railroad tracks at a 90-degree angle to avoid getting your tires trapped in the tracks. “Slowing” used when slowing to make a stop or beginning to pull off the road to stop. “Stopping” used after you call out slowing and are ready to come to a full stop. If you are stopping to rest or stretch or even change a flat; it is crucial that you pull completely off the bicycle lane of traffic. “Turning” used when making any type of turn and always in conjunction with the appropriate arm turn signal. You must at all times be aware of your surroundings and alert to all possibilities. On a group ride, there will be other riders on roads alongside vehicles of all sizes. It is crucial that you stay alert and ride smart, predictably and deliberately. Be prepared to stop at any moment. Be aware that each of your actions will dictate how the person behind you, or the automobile beside you, reacts. That a bicycle be considered a vehicle with the same privileges and restrictions as a car. That you obey all traffic laws, traffic signals and stop signs. That you ride with the traffic – NOT against it. That you use hand signals to indicate your intentions. In general, bicycles have the legal right to share the road on most public highways. Bicyclists must comply with governing laws, and can be ticketed for violations. In the case of children, parents or guardians may be held responsible for any fines.